Naše laboratoř se zabývá studiem metabolismu a působení růstových regulátorů, polyaminů a fenolických látek v rostlinách. Věnujeme se otázkám úlohy těchto látek ve vývoji rostlin a v odpovědi na abiotický stres. Používáme různé rostlinné modelové systémy - od celých rostlin až po buněčné kultury. Největší pozornost věnujeme procesu somatické embryogeneze jehličnanů; studujeme zákonitosti vývoje embryí, hormonální regulaci procesu somatické embryogeneze i vliv stresových faktorů na vývoj somatických embryí. Somatic embryogenesis techniques have been developed for most coniferous species, but only using very juvenile material. To extend the techniques’ scope, better integrated understanding of the key biological, physiological and molecular characteristics of embryogenic state is required. Therefore, embryonal masses (EMs) and non-embryogenic calli (NECs) have been compared during proliferation at multiple levels. In summary, the exposure of Norway spruce EC to UV-B radiation at different stages of maturation had the strongest effect on cell viability of embryos at early stages of development and resulted in the inhibition of somatic embryo development and/or the substantial decrease in the number of embryos. The extent of cell damage was dependent on the UV-B dose applied, as well as the embryo developmental stage, and might be related to differentiation of the outermost cell layers and formation of protoderm. 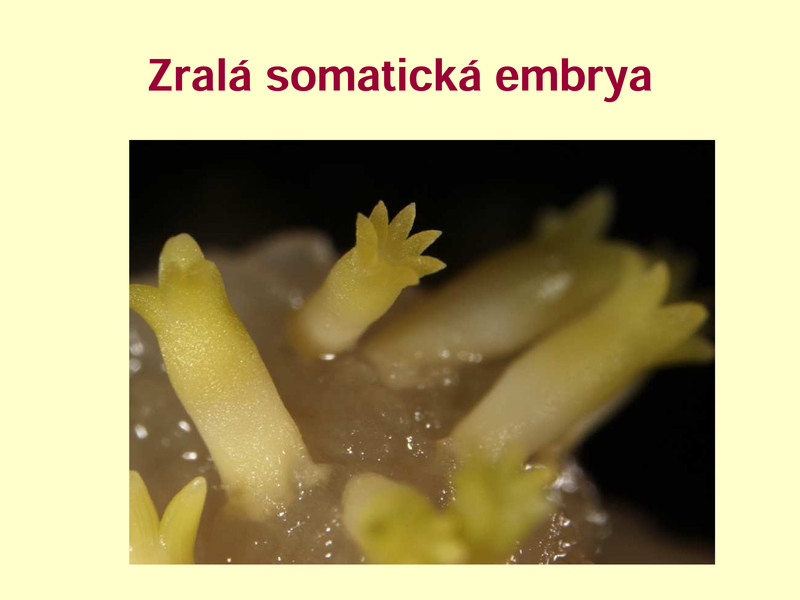 Conifer somatic embryogenesis (SE) is a process driven by exogenously supplied plant growth regulators (PGRs). Exogenous PGRs and endogenous phytohormones trigger particular ontogenetic events. Complex mechanisms involving a number of endogenous phytohormones control the differentiation of cells and tissues, as well as the establishment of structures and organs. Most of the mechanisms and hormonal functions in the SE of conifers have not yet been described. 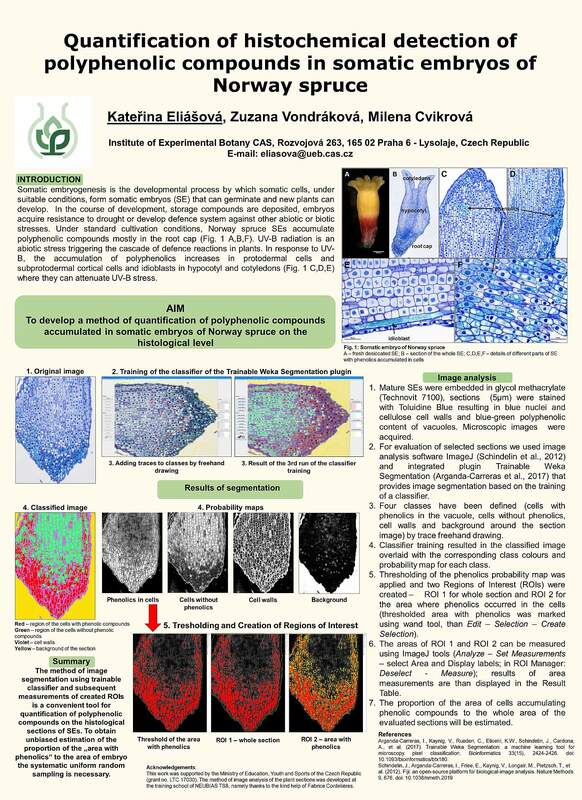 This first report of cellular and molecular changes after repetitive somatic embryogenesis in conifers shows that each cycle enhanced the structure and singularization of EMs through modulation of growth regulator pathways, thereby improving the line´s embryogenic status. Under standard cultivation conditions, Norway spruce somatic embryos (SEs) accumulate polyphenolic compounds mostly in the root cap. In response to UV-B, the accumulation of polyphenolics increases in protodermal cells and subprotodermal cortical cells and idioblasts in hypocotyl and cotyledons where they can attenuate UV-B stress. To quantify polyphenolic compounds accumulated in somatic embryos on the histological level resin sections were prepared, stained with Toluidine Blue.